The recent news on genetic manipulations coming out of Newcastle University (see article) is a poignant reminder of how far our culture is willing to go in the name of scientific progress—that is mix-and-matching human embryos to create one free from disease. Last year similar research in the United States was conducted on monkeys and thus far had shown much promise for human application, however—as is the case in many scientific areas—researchers have put the cart before the horse. That is, before any conclusive evidence barring long-term side-effects, researchers have decided to conduct preliminary trials on human embryos. When I read the report last week I was initially struck by a sense of confusion, and so I scoured the internet for all articles written on the subject and upon finding several contradictions I decided to ask lead researcher Professor Doug Turnbull. His reticent response to my email was enough to clarify my confusion, and shake my head in disbelief. Our bodies are made of billions of cells and in each of those cells there are mitochondria—the energy producing units of cells. Without them, good luck walking, talking, thinking or breathing. Every single body function is dependent on these minuscule members, and just like a computer is useless without a power source so are our cells. Genetic mutations in mitochondria can cause mild to severe diseases including: neuropathies, diabetes mellitus and deafness, and progressive vision loss, just to name a few. By going directly to the source of the malaise—the mitochondria—Prof. Turnbull and his colleges are aiming at eliminating any future disease during development or after birth. Who can argue with that? 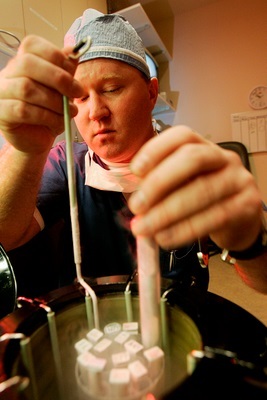 Unfortunately, the procedure in question involves removing the DNA of the desired individual (embryo)—containing the defective mitochondria—and placing it into another embryo, which has had its DNA removed and contains normal mitochondria. The end result is an individual with the genes of the mother and father placed inside a donor embryo with disease-free mitochondria and removed DNA. Are you telling me you are sacrificing one embryo—a unique member of the human family—in order to create another altered embryo? That’s exactly what is happening, and it sounds a lot like eugenics to me. Furthermore, it’s tantamount to killing another person for one of their organs in order to replace my dysfunctional one. When it comes to embryonic research is seems as if anything goes. Ultimately, the difficulty with bioethics is that what we can’t see is relegated to a position of inconsequence. Yet, no matter what stage of development, every life is chosen and loved by God.